A Kotis, P Brestas, L Guidaglia, O Dafni, E Solounia, C Tsagari, K Giannaki, N Michalakis. 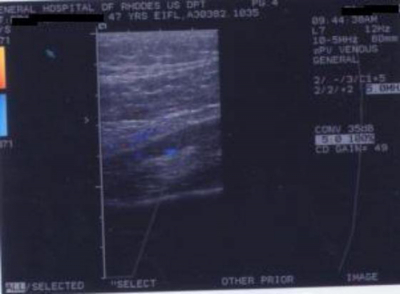 Ultrasound With SHU 508A In The Diagnosis Of Suspected Lower Limbs Deep Vein Thrombosis. The Internet Journal of Internal Medicine. 2004 Volume 5 Number 2. Purpose:The purpose of this study was to determine whether intravenous use of Levovist can improve the diagnostic value of the method by reducing the percentage of indeterminate scans. 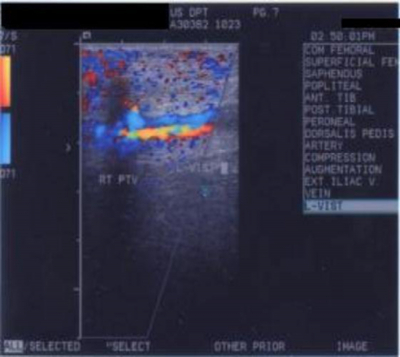 Methods and Materials: Sixty patients with clinical suspicion of lower limb DVT were examined sonographically with and without the use of Levovist. Most frequent symptoms were pain, swelling, fever and clinical signs were tenderness, redness, local heat, edema and prominent superficial veins. Results: Cases classified, as patients with non-enhanced CDU were 26, while classified DVT free were 24. True positive diagnoses were 25 and the true negatives were 20. Sensitivity of CDU was increased from 86,2% without Levovist to 93,8% with it, specificity from 95,2% to 96%,positive predictive value from 96,2% to 96,8%, negative predictive value from 83.3% to 92,3% and accuracy from 90% to 94,7%. Conclusion: Color doppler sonography is highly accurate for the diagnosis of deep vein thrombosis in symptomatic patients. Sixty patients with clinical suspicion of lower limb DVT were examined sonographically with and without the use of Levovist. Suspicion of this clinical entity was based on the patients' clinical symptoms and risk factors. Most frequent symptoms were pain, swelling, fever and clinical signs were tenderness, redness, local heat, edema and prominent superficial veins. Most frequent predisposing factors were prolonged bed rest and recent surgery. Cases classified, as patients with non-enhanced CDU were 26, while classified DVT free were 24. True positive diagnoses were 25 and the true negatives were 20. In 10 patients the result of CDU without Levovist was considered as indeterminate. Among them, 4 patients were finally found to suffer from DVT and 6 were not. The use of contrast medium resulted in 31 positive diagnoses and 26 negative. Among them 30 were true positive and 24 true negative. Exams in which positive or negative diagnosis could not be made with absolute confidence were 3. In these cases ascending venography was the immediate next step, which in one out of these 3 cases revealed DVT. Some cases are seen in figures 1, 2, 3, 4, 8 , 9, 10, 11,12, and 13. 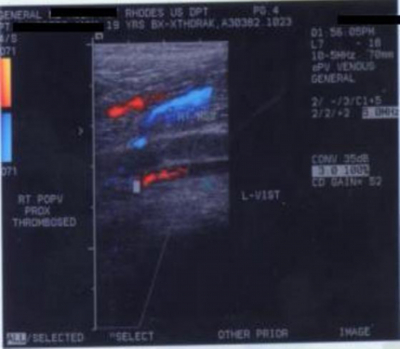 Figure 2: CDU with administration of signal enhancing contrast agent shows a considerable increase in Doppler signal intensity during distal calf compression revealing that the individual tested does not have DVT. Sensitivity of CDU was increased from 86,2% without Levovist to 93,8% with it, specificity from 95,2% to 96%,positive predictive value from 96,2% to 96,8%, negative predictive value from 83.3% to 92,3% and accuracy from 90% to 94,7%. The percentage of indeterminate scans was 16,7% with and 5% without Levovist. All the results mentioned above are summarized in tables 7-8 and Figures 5 & 6. Reduction in the number of indeterminate scans from 10 to 3 was the main reason, which caused the slight increase in parameters of diagnostic value detected in our study. The use of contrast medium seems to improve imaging quality in some cases with obesity or soft tissue swelling where non-enhanced color doppler imaging was not satisfactory. In some other cases, in which compression difficulty due to muscle spasm was the reason of false positive diagnosis, improved color doppler image with L-Vist led to correct diagnosis. 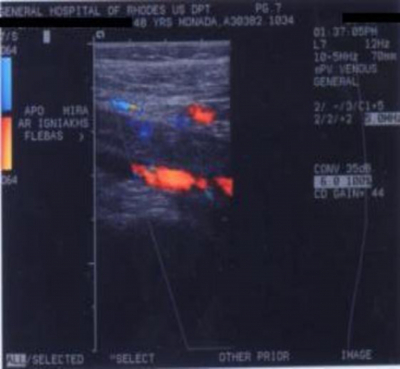 The anatomic region where color doppler detection of DVT was inadequate included mainly calf veins. 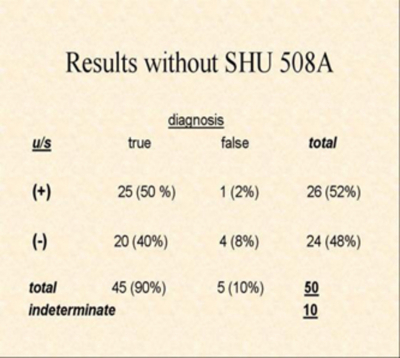 The probability that an individual, who tests positive for DVT, actually has the disease, is high without use of SHU 508A. This explains why positive predictive value did not show any significant increase. We should point out several limitations of this study. As far as patients' enrolment is concerned, the only inclusion criterion was the existence of clinical symptoms or signs. This fact should not be considered as focusing on a subset of patients or some kind of convenience sampling, but part of our methodology. A second point is that, excluding indeterminate CDUs from calculation of diagnostic value parameters (PDV) can be considered some kind of methodological weakness-bias inherent in our study. For that reason we should notice that parameters with greatest calculation reliability in our study are PPV and NPV, because they are independent from the rate of indeterminate scans. The high initial number of indeterminate scans implies a limitation. This weakness is attributed to technical-equipment reasons, to patient factors, to operator exam dependence and to small number of patients. However the study shows that in cases where limitations lead to high initial rate of questionable results administration of contrast medium can be useful. 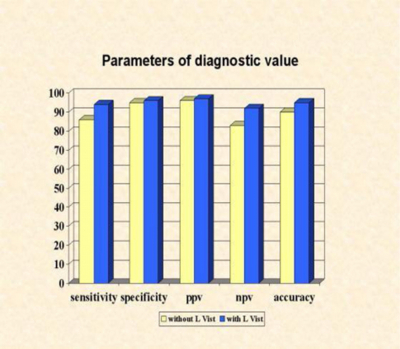 Considering all the above factors as inevitable and not excluding indeterminate scans from PDV calculations would lead to the maximum increase of sensitivity, specificity and accuracy from about 75% without L-Vist to about 90% with it, showing a very important contribution of the contrast agent. On the other hand, 4 considering that equipment or operator dependent factors, causing diagnostic pitfalls and leading to a high initial percentage of inconclusive scans could be almost completely eliminated, we can calculate the minimum increase in sensitivity, specificity and accuracy referred at the beginning of this section. Finally we should take under consideration that purpose of our study was to evaluate the possibility of confirmation or exclusion of DVT before and after administration of signal enhancing agent and search for possible reduction in the rate of inconclusive scans. In conclusion when veins are not compressible or when a thrombus is evident inside then diagnosis can be made with high confidence without need of a contrast agent or further diagnostic procedures. On the other hand the probability of no DVT, given a negative CDU result, increases when the exam takes place using a signal-enhancing agent. 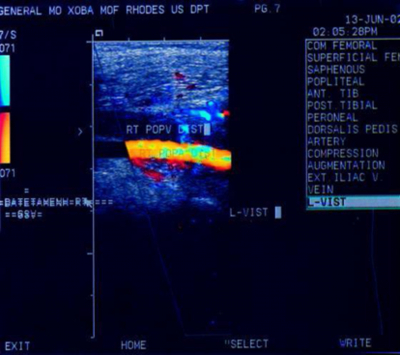 Color doppler sonography is highly accurate for the diagnosis of deep vein thrombosis in symptomatic patients. 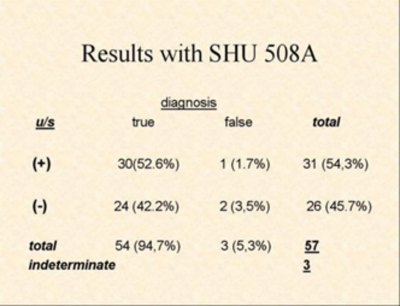 The use of SHU 508A improves the quality of color doppler examination especially in indeterminate cases. This results in increasing parameters of diagnostic value of the method. In cases with strong clinical suspicion of DVT and negative initial CDU assessment the use of contrast medium may be helpful, adding little diagnostic information. 1. Scharz K.Q., Becher H., Schimpfky C. et al. Doppler enhancement with SHU 508A in multiple vascular regions. Radiology 193:195,1994. 2. Mattos A.M., Melendres G., Summer D.S., et al: Prevalence and distribution of calf vein thrombosis in patients with symptomatic DVT: A color-flow duplex study.J Vasc Surg 24; 738,1996. 3. 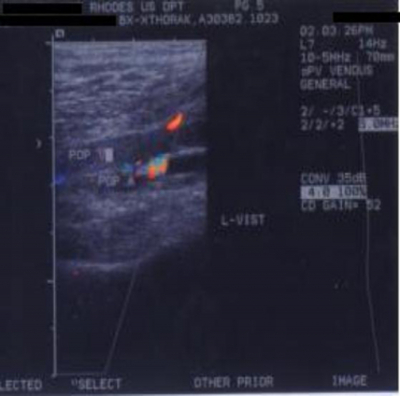 Bucec R.A., Kos T.,Schober E.,et al : Ultrasound with levovist in the diagnosis of suspected calf vein thrombosis. 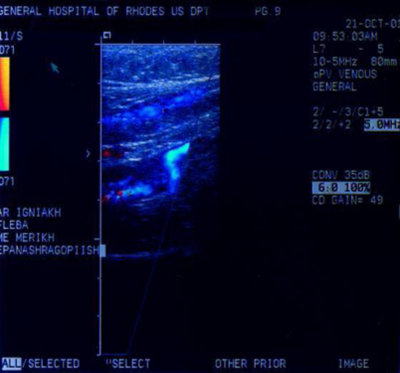 Ultrasound Med Biol 2001 Apr; 27(4):455-60. 4. 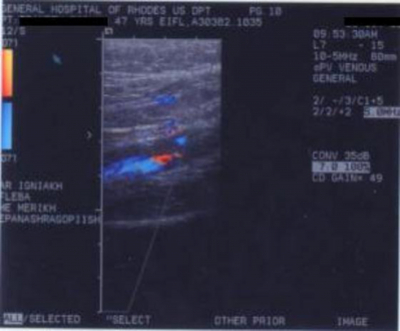 Baxter G.M., McKechnie S., Duffy P.: Colour Doppler Ultrasound in deep vein thrombosis: a comparison with venography. Clin Radiol 1990 Jul; 42(1): 32-6. 5. Puls R., Hosten N., Bock J.S, et al. 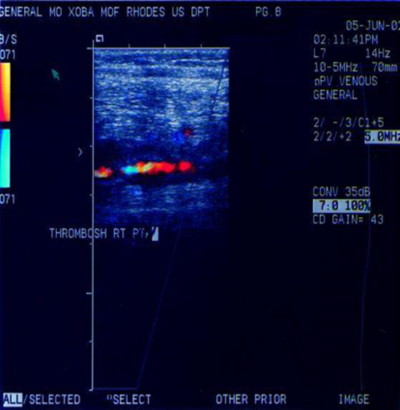 Signal-enhanced color Doppler sonography of deep venous thrombosis in the lower limbs and pelvis. J Ultr Med 1999 Mar; 18(3):185-90. 6. 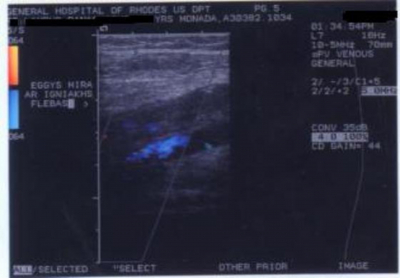 Pezzulo J.A., Perkins A.B., Cronan J.J. Symptomatic deep venous thrombosis: diagnosis with limited compression US. Radiology 1996; 198:67-70.